When did I fall in love with hip-hop? The year was 1992. Growing up as a suburban white kid in St. Louis, it took me a bit longer to discover the genre. At the age of 16, I became acquainted with a group of classic albums that rarely left my stereo. Public Enemy's Fear of a Black Planet, A Tribe Called Quest's The Low End Theory, De La Soul's Three Feet High and Rising, Eric B. & Rakim's Don't Sweat the Technique. These releases drew me to other notable groups and helped to generate my love of hip-hop. Artists like Common, The Roots, Jurassic Five, and Mos Def carry the gauntlet today for the groundbreaking rappers of the past. This positive spirit resounds everywhere in Brown Sugar, an engaging love story fueled by the energy of hip-hop. Although the story remains pretty straightforward, the love for the music keeps everything flowing nicely. The major characters are realistic and well drawn, which leads to a few surprising moments that stray from the typical formula. Dre (Taye Diggs) and Sidney (Sanaa Lathan) have been close friends since the age of 10, when they bonded while viewing future stars Doug E. Fresh and Slick Rick rapping in their neighborhood. Now in their late 20s, the duo's relationship and love of hip-hop has remained strong throughout the years. However, they have never moved it beyond the "just friends" level. Everyone around them recognizes the mutual attraction, but neither is willing to admit their feelings. When Dre falls in love and becomes engaged to Reese (Nicole Ari Parker, Dancing in September), it causes Sydney to reconsider her feelings. Meanwhile, she becomes involved with New Jersey Nets' superstar Kelby (Boris Kodjoe), a tender guy but not really a hip-hop lover. Will Dre and Sydney eventually realize their true feelings? The answer is fairly obvious, but it still leads to an enjoyable conclusion. Dre and Sidney's relationship to hip-hop also defines their professional life. He works as a top producer for Millennium Records, a typical label solely concerned with manufacturing hits. The latest pathetic act forced upon him is Ren and Ten�"the hip-hop dalmations"�who reinforce the lack of artistic integrity in his work. Meanwhile, Sidney has just taken a job as an editor of XXL, an unexplained magazine covering the genre. She also is writing a "love letter to hip-hop" for publication. Their conversations about music still possess the innocence of teenagers speaking in awe about their favorite artists. Unfortunately, the realities of the professional world have muddled this purity for Dre. He discovers something natural in Chris (Mos Def) and wants to create something real. Is that still possible in today's music world? This tale succeeds through the efforts of a talented cast of young stars who continue to improve. Diggs and Lathan both performed well in The Best Man, another effective romantic comedy, and she also shined in Love and Basketball. While creating excellent music, Mos Def continues to prove his acting mettle. His understated performance in Monster's Ball was overlooked by many critics. Even while playing a familiar role here, he creates original nuances that make Chris more realistic. Parker and Kodjoc avoid making their difficult roles unlikable, always a popular choice in this genre. Queen Latifah also provides impressive energy while playing her usual supporting role. Director/co-writer Rick Famuyiwa (The Wood) and writer Michael Elliot (Like Mike) deserve praise for avoiding most of the typical conventions. Sidney actually is the story's main character and embodies its central themes, which is a nice adjustment. They also make Dre less smooth than the handsome Diggs' usual character, which is not an easy task. Lathan and Parker both look stunning, but they also are adults with understandable reactions to their difficulties. Dre's final moments with Reese reveal an emotional center often missing from the genre. Image Transfer Review: Brown Sugar utilizes an attractive 1.85:1 widescreen anamorphic transfer with few defects or shortcomings. Filmed mostly in New York, the movie presents an array of picturesque local settings. The bright colors shine nicely from the screen, and little grain appears during the darker shots. The reverse side offers the option of the pan & scan, 1.33:1 full-frame format. This version will draw cheers from viewers still failing to realize the benefits of the widescreen transfer. Audio Transfer Review: An impressive collection of hip-hop tunes dominates this soundtrack, and it booms powerfully from an effective 5.1-channel Dolby Digital transfer. When Mos Def performs early in the film, we experience the atmosphere of the concert hall. This track also sports a good complexity, and the sounds move well through the sound field. The dialogue is also clear and easily understandable, which leads to an excellent transfer. Extras Review: Brown Sugar offers a decent number of supplements spread across both sides of the disc. The most significant one is a feature-length commentary from co-writer/director Rick Famuyiwa and editor Dirk Westervelt. They both seem to enjoy discussing the picture, which makes the track more accessible. Famuyiwa has a relaxed form of delivery that sometimes becomes dull, but he does provide some interesting statements. While not the most exciting comentary ever, it is worthwhile due to the speakers' compassion for the material. The other major extra features are four deleted scenes and two music videos. The cut sequences cover about six minutes and were mostly removed for pace issues. The best moment shows Dre and Sidney speaking about their favorite hip-hop artists. During the optional commentary, Famuyiwa even asks "Why did we cut this scene?" The music videos present two excellent tracks—Love of My Life (An Ode to Hip Hop) from Erykah Badu featuring Common and Mos Def's Brown Sugar, featuring Faith Evans. The first number includes cameos from MC Lyte and Chuck D and perfectly matches the tone of the picture. It is one of the better singles from the past year and received a Grammy nomination. The second track is a bouncing tune with a fun mixing of rap and r&b. The video features numerous girls in various states of undress. The remaining supplements include a brief soundtrack spot and trailers for Antwone Fisher and this film. Both previews offer impressive widescreen transfers and decent stereo soundtracks. Hip hop continues to find new fans and sell more records each year. However, fans often are more drawn to flashier acts like Eminem, Puff Daddy, and Ja Rule while missing some great underground artists. 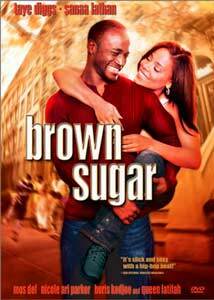 Brown Sugar exudes a true love of the true elements of the genre. Framed within a decent love story, this film should please music fans and audiences just looking for an enjoyable romantic comedy.